The TASH Score predicts the need for massive transfusion based on clinical and laboratory data. The TASH (Trauma Associated Severe Hemorrhage) Score helps identify the patients who may benefit from massive transfusion protocols, which the protocols themselves do not do. It performed better than the Assessments of Blood Consumption (ABC) Score and other nonweighted scores for predicting transfusion requirements (Brockamp 2012). It requires lab results (hemoglobin and base excess), which may delay the decision to initiate massive transfusion longer than scores that require only clinical parameters, although a prospective study showed that the mean time to calculate the TASH score in a cohort of trauma patients was within 8 minutes of emergency department arrival (Mutschler 2014). Providers may wait too long to begin massive transfusion, thus increasing a patient's morbidity and mortality by not transfusing early enough, or they may increase a patient's morbidity (including sepsis, acute respiratory distress syndrome, etc) and mortality by transfusing blood products unnecessarily. Use the TASH Score to determine when to initiate massive transfusion protocols on trauma patients. Massive transfusion protocols are institutionspecific, but often the ratios are 1:1:1 or 1:1:2 for fresh frozen plasma, platelets, and packed red blood cells (Holcomb 2015). Remember that the TASH Score does not indicate if trauma patients should receive blood; it only indicates if they should receive blood through a massive transfusion protocol. The TASH Score was derived and validated from a database of over 35,000 patients in the trauma registry of the German Trauma Society (TR-DGU) to predict the need for massive transfusion. Maegele et al revalidated the TASH Score on 5834 datasets from the 2004 to 2007 TR-DGU database with respect to discrimination, precision, and calibration. In comparing the score’s performance here to its initial performance, the performance of the score was enhanced, reflected by an increased receiver operating characteristic curve/area under the curve ratio of 0.905. The studies described above almost exclusively involved blunt trauma patients. Subramanian et al conducted a retrospective analysis of all trauma cases registered at the JPNA Trauma Centre (a Level I trauma center) in New Delhi, India, including both blunt and penetrating trauma. The TASH Score had the highest diagnostic accuracy (57.1%) compared to other prediction models, including the Emergency Transfusion Score (22.8%) and the ABC Score (13.1%). The number of variables required to calculate the TASH Score, relative to other prediction models, has been seen as another limitation. However, a prospective analysis by Mutschler et al concluded that the mean time to complete the TASH Score calculation in a cohort of trauma patients was within 8 minutes of arrival at the emergency department, which is similar to other prediction scores. Yücel N, Lefering R, Maegele M, et al. Trauma Associated Severe Hemorrhage (TASH)-Score: probability of mass transfusion as surrogate for life threatening hemorrhage after multiple trauma. J Trauma. 2006;60(6):1228-1236. Maegele M, Lefering R, Wafaisade A, et al. Revalidation and update of the TASH-Score: a scoring system to predict the probability for massive transfusion as a surrogate for life-threatening haemorrhage after severe injury. Vox Sang. 2011;100(2):231-238. Holcomb JB, Tilley BC, Baraniuk S, et al. Transfusion of plasma, platelets, and red blood cells in a 1:1:1 vs a 1:1:2 ratio and mortality in patients with severe trauma: the PROPPR randomized clinical trial. JAMA. 2015;313(5):471-482. Brockamp T, Nienaber U, Mutschler M, et al. 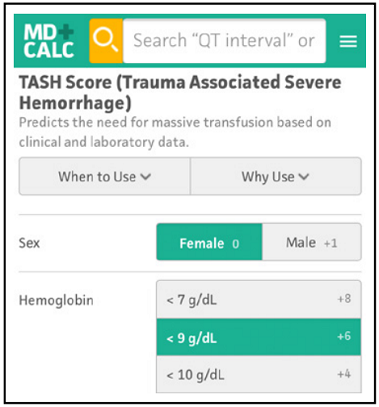 Predicting ongoing hemorrhage and transfusion requirement after severe trauma: a validation of six scoring systems and algorithms on the Trauma Register DGU. Crit Care. 2012;16(4):R129. Subramanian A, Albert V, Sharma S, et al. Assessing the efficiency of scoring system for predicting the probability of massive transfusion in trauma patients. J Hematol Thrombo Dis. 2014;2:161. Mutschler M, Brockamp T, Wafaisade A, et al. 'Time to TASH': how long does complete score calculation take to assess major trauma hemorrhage? Transfus Med. 2014;24(1):58-59.